The affirmation letter (signed by the CEO) is a requirement confirming your request for technical assistance. 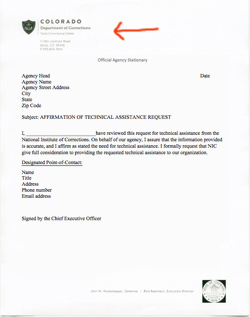 Download  the template here, print it out on agency letterhead, and have the CEO sign it. Then upload the completed document below. This field is first so it does not get overlooked. It's best to have this document ready to upload prior to filling out the form. What is the criminal justice service area you are seeking assistance for? Promote and assist efforts to ensure safe, cost-effective, and efficient prisons, jails and community corrections programs and facilities through effective management and operations. Strengthen the knowledge, skills and effectiveness of correctional personnel in operating safe, efficient and constitutional systems. Promote problem solving, the exchange of effective strategies and improved capacity of tribal, local, state, federal and foreign corrections agencies through an information clearinghouse, networks, intergovernmental partnerships and other information sharing. Promote and assist agencies in providing offender services through classification, programs, management of special populations, productive work and education, religion and social services supporting responsible, law-abiding behavior for offenders during the period of correctional supervision and after release. Promote and assist the development of effective criminal justice systems that improve public safety, enhance the public trust, and coordinate the use of state and local resources while appropriately using pretrial, sanctioning, supervision, and control options for offenders. Briefly describe the problem for which assistance is requested. In your statement, include why the need cannot be met within the agency. (e.g., "We would like to more effectively manage our multi-generational workforce more effectively, attract and retain solid high-performing staff, and improve staff morale today and in the future.") What background, context or supporting documentation can you share with NIC that have an effect on the problem(s) that you would like to resolve. Please select the NIC Division that most closely represents your request. Is the training or presentation needed in a language other in English? Did you speak to someone at NIC prior to submitting this request? If so, please provide the name. If you have questions about your request prior to submitting this form, please email or call one of the managers below. Please click the Submit button to send this form directly to NIC and also a copy to yourself.